When is the last time you compared all your insurances to get the right option for your circumstances and weren’t paying for insurance you didn’t need? I’ve heard from readers where they have been paying double insurance because they didn’t realise one was on auto renew or being direct debited and they didn’t cancel it when they compared and switched or others who have been paying for insurance on items they no longer have or need. In 2012 I save $1,700 on my insurance in one day. I compare regularly, however, at the time one of the things that made a large difference was no longer having my now ex husband on the policy. That alone saved me $1,000! I changed the driver age to be above 25 only and my car was garaged as I had moved house. The move saw a significant drop in my home and contents insurance as well. In 2012 I was robbed of everything including my underwear. I had contents insurance so was covered, had I not, I would have struggled as I had just left my abusive marriage and had two little girls to look after. To me, insurance is essential in certain areas of my life. It is up to you to decide what insurance you need such as car, house, contents, life, pet, health etc. 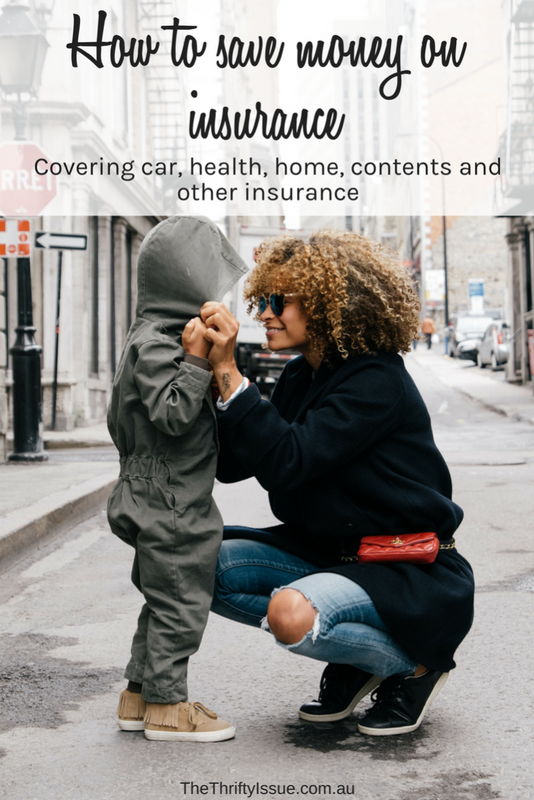 This post covers my tips to reduce the expenses on the insurances I know about. If you had finance on your car when you first got your insurance but don’t anymore, this can reduce your premium. Call to let your insurance company know. Compare the policy with varying excess amounts to find one you are happy with (for the most part, I have found a higher excess doesn’t actually save that much money and can cost more if you are in an accident). Do not automatically renew your insurance when it is sent to you. Do a comparison online and check it is still the right policy for you. I know many people who have done a comparison, even with the company they are with and had a premium offered that was lower than their renewal. Age limits impact your car insurance premium. If you can have a policy with older drivers, you can save a lot. Some insurers only insure you for the market rate which means if you have an accident, they can determine the value based on a low market rate. My preference is to go with an agreed value so I know how much I will get should anything happen. Even if you rent, you still need some insurance for your belongings. If you own your home, it is crucial you have it insured! Can you afford to rebuild, fix damage from storms or replace all your belongings? If the answer is no, you definitely need insurance. In 2012, I was renting and was robbed of everything including my underwear. This was covered by my insurance (although it took a while to get sorted). Many people mistakenly assume they do not need insurance if renting. Your landlords insurance protects them and their property, not whatever is in your home! This applies to the home you own if you are a home owner plus the contents for both home owners and renters. If you are a home owner, how much would it cost to rebuild your home if needed (and remove the old home if needed), for example in the case of a bushfire or flood? That is the price to insure for, or around it. You do not need to insure the home for the total value of the land and house at current market value, only the price it would cost to clear debris and rebuild. Make sure you allow a buffer though, as you don’t want to be caught short. For items you own, work out the actual cost of replacement, don’t just guess. It adds up quickly, all your appliances, furniture, clothing, jewellery, everything. Also, if you have items of significant value, it is good to consider including them individually on your policy. If you are moving, check to see what the insurance is like. I have lived in 4 cities in Australia and many areas within those cities. The insurance has varied a lot and in some cases, the difference was hundreds of dollars a year. It came down to the crime rate in the area, particularly home break ins or if the area was prone to floods/bushfires or other natural disasters. If you have any items of high value, list them individually. This is especially important for jewellery as policies only allow for a certain amount of jewellery. Do a full comparison of health insurance using this government website, not a commercial health insurance comparison site. Those sites only present you with the options they own or have access to, not all options. I have never gotten a better deal from them nor has anyone else I know. I have had multiple surgeries and most of the time my surgeons did it with no gap, meaning no out of pocket expenses for me and advised me to ask the anaesthetist to do the same. One call to the anaesthetists saved me $900! It doesn’t hurt to ask. Go over all your insurance such as pet, boat, caravan, bike, life, TPD, funeral and other insurances. Do you need them all? Can you get a better deal on any of them? When comparing insurance policies make sure the features, benefits and payouts are the same so it is accurate. Many cheap policies might have hidden fees, only use market value or have high excess. Which insurance do you think is essential and how do you save money with it?